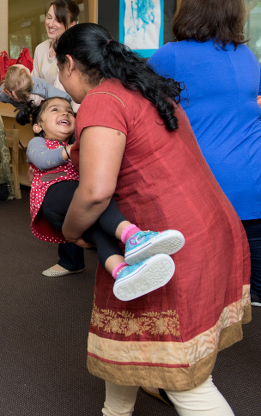 Activity focuses on interactive rhymes, stories, and songs, all presented orally or, in the Auslan (Australian Sign Language) Parent-Child Mother Goose Program, through the air. Printed versions of the rhymes and songs are supplied at the end of a series of meetings when the participants have had time to internalise some of the material and use it in their everyday lives. No toys or objects are used. Program facilitators are trained in the principles, materials and methods needed to run the program effectively. Each program has at least two facilitators who share all teaching duties and take time together after each session to discuss their observations of the interactions within the group, to review and make notes on the session activities, and to plan the next session based on their observations and the perceived needs of participants.